Planning a whirlwind trip through the hottest up and coming pocket of the America’s? Then read our ultimate guide to Central America: All You Need to Know and get ready to tantalize all your senses. An extensive part of Latin America which encompasses countless and distinctive indigenous cultures, an abundance of fantastic ancient sites and more sparkling beaches, rainforests, volcanoes and highlands than you could ever visit even in a dozen trips, Central America is packed full of exceptional highlights. Trying to combine a guide for this region is a nearly impossible task yet if you’re looking for inspiration for your next jaunt to Latin America, and want something to whet your appetite, then we hope this guide will do the trick. 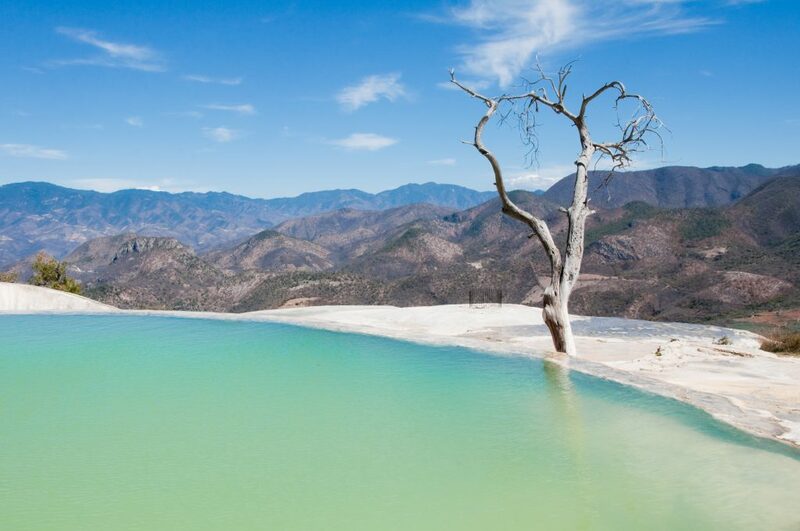 The Oaxaca Thermal Spring in Mexico. Photo credit: Shutterstock.. If you could sum up Central America in just a single adjective, it would have to be ‘diverse’. A slender slither of land all too often overlooked by travellers, Central America comprises the countries of Belize, Guatemala, Honduras, Nicaragua, Costa Rica, El Salvador, and Panama, as well as Mexico, Cuba and the Caribbean Islands – although the latter three are geographically part of North America. Nevertheless, when planning a trip through the Central America region, most travellers will undoubtedly consider travel through any and all of these countries. Snuggly cradled by the Caribbean Sea on the east and Pacific Ocean to the west, Central America is a small isthmus that manages to pack two continents’ worth of exciting adventures in a land roughly the size of Texas. Yet due to political instability through some Central American nations during a good part of the last half a century, the entire region was well off the well-trodden tourist path for years. Luckily, things are looking up for this part of the world, and everyone is finally taking notice. What’s more, with the recent easing of tensions between the US and Cuba, the whole region has come under the tourist hotspot, so there’s never been a better time to plan a trip to Central American than right about NOW. What makes Central America so special? To those who have never been, Central America may seem like one homogenous destination, yet nothing could be further from the truth. 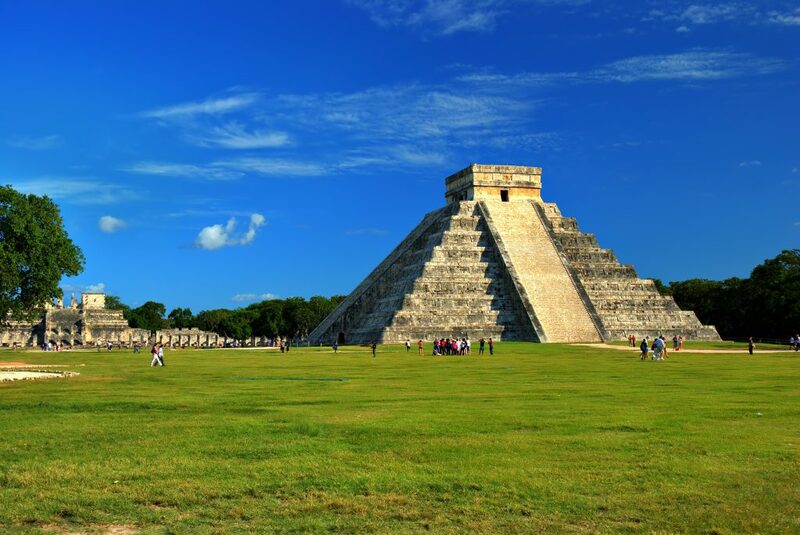 Due to very differing topography, history, and cultural influences, each country boasts unique attributes yet all share enticing commonalities: from resplendent natural wonders to fascinating indigenous cultures, overload of mesmerizing historical ruins (do the mighty Mayans ring a bell?) and more tropical gorgeousness than the rest of the world combined. The (relative) diminutive size of the region means that you can experience all of these highlights in one single, totally unforgettable trip. A multi-country tour in Central America is not just easy but also convenient and very doable even within a short time-frame. Some countries, like Mexico, Costa Rica and Belize, boast very good tourist infrastructure, making them ideal for shorter trips and exciting family vacations. Generally speaking, the ideal time to tour Central America is during the driest months of the year, between December and March, although given the varying geography of the region, this is highly relative. Your ideal time to visit Central America will depend highly on where you want to go, and what you want to do. Given that the driest months coincide with end of year holidays the world over, these are also peak tourist seasons, yet we can certainly plan a tailor-made tour of Central America that will dodge the crowds and take you right off the beaten track. Besides, the period around Easter is particularly magical, as the whole region literally explodes in celebrations of Semana Santa, so if you’re up for an unforgettable cultural infusion then join the crowds and fiesta with gusto. Stunning landscapes in Costa Rica. Photo credit: Shutterstock. Costa Rica, Belize, and Mexico are the most visited countries in the whole region, so if you’re planning a jaunt through lesser visited destinations then peak season crowds are not going to be as much of a bother. It’s also worth noting that the rain season can be a very rewarding time of year to visit, when cloud and rainforests are resplendent, and crowds at popular historic sites at their smallest. This is provided you’re a morning person, and don’t mind sitting out the few hours of afternoon rains every day. The siesta was probably invented to maximise relaxation in Central America during rainy season! The only main drawback during wet season is that some of the more rugged roads become water logged and impassable, so picking just a couple of places to use as a base for day trips in surrounding areas is your best bet. Temperature-wise, you can expect gloriously hot days all year round, the only exceptions being in high mountainous areas. The shoulder months (April and November) are also quite perfect, as you’ll suffer far fewer rainy days and still enjoy blissfully uncrowded sites, beaches, and national parks. Coral reefs abound along both sides of the Central American coastline, and given the year-round idyllic temperatures, it’s no surprise that this entire region is a diver’s and snorkeler’s paradise. Beach lovers and surfers will find near endless stretches of beach, often framed by pristine cloud and rainforests, ideal for nature and wildlife lovers too. For culture and history, Central America is simply unrivalled. The whole region overflows with Pre-Columbian UNESCO-listed historical sites, where pyramids, temples, and entire ancient cities make for insanely photographic backdrops. And if you need even more excitement, you’re bound to find them in Central America’s mountain ranges, where active volcanoes vie for hiker’s attention, and array of natural thermal springs soothe their tired muscles. Heading to Central America for the very first time? Then here are the very best highlights of the region. 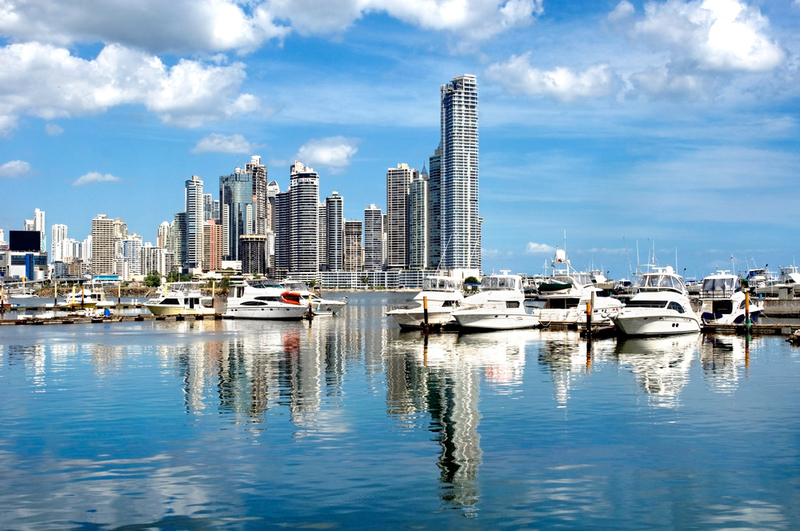 The modern skyline of Panama City. Photo credit: Shutterstock. The most cosmopolitan and vibrant capital in all of Central America, Panama City will WOW you with her flamboyant modernity and inherent trendiness. A colonial quarter that’s worth its weight in gold, and its proximity to the world famous Panama Canal, and lesser-known but drop-dead gorgeous Canarreos Islands, this is a city you may want to spend a few days in. The country’s top honours, however, still fall heavily on the astonishing Panama Canal, one of man’s most impressive feats of engineering and a recently-widened maritime marvel. 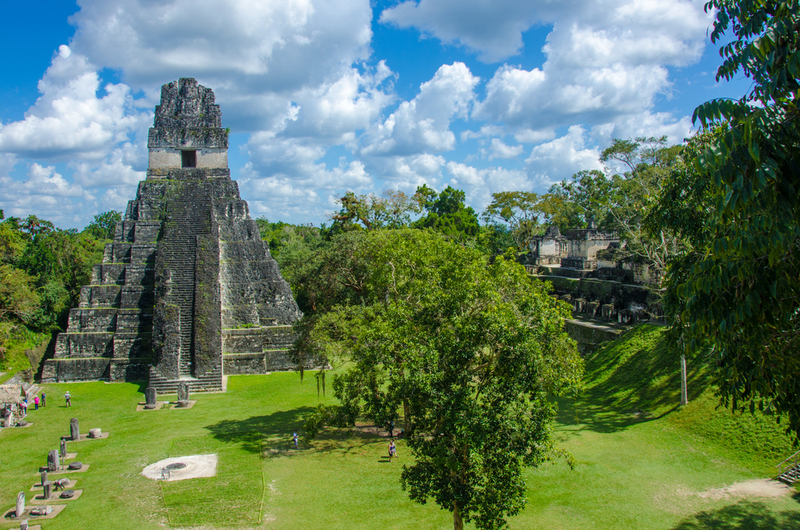 Central America is not exactly short on Mayan ruins, yet among all the collection (and trust us, it is extensive) Tikal shines through as the most magnificent of all. Set amidst a verdant jungle, with pointy pyramid tops peeking through the verdant canopy, Tikal is an absolute sight to behold. One of the largest Mayan cities ever built, Tikal is said to have housed 100,000 people at its peak. 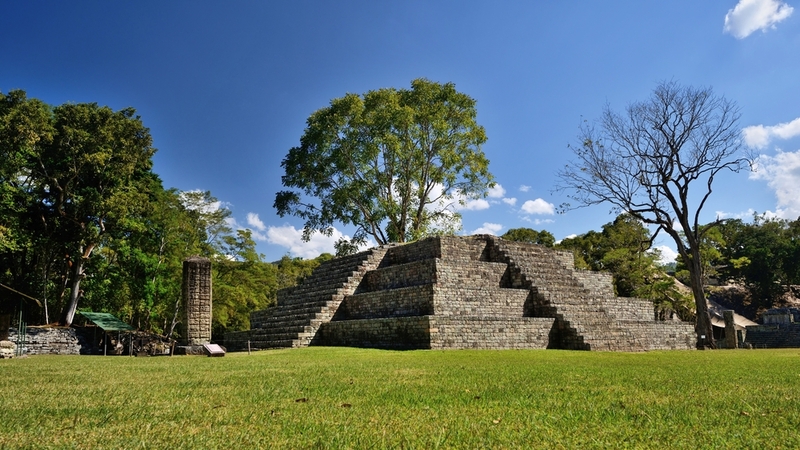 Copan may not boast the gargantuan size of Tikal, yet to the Mayans this was the most prominent capital city of all. The mystical heart and soul of the Mayan culture, Copan is one of the lesser visited UNESCO sites, where you can discover a wealth of incredibly detailed carvings. The near-perfect preservation of this site, and the fact that it’s off the beaten track, means that a visit here is abundantly rewarding. 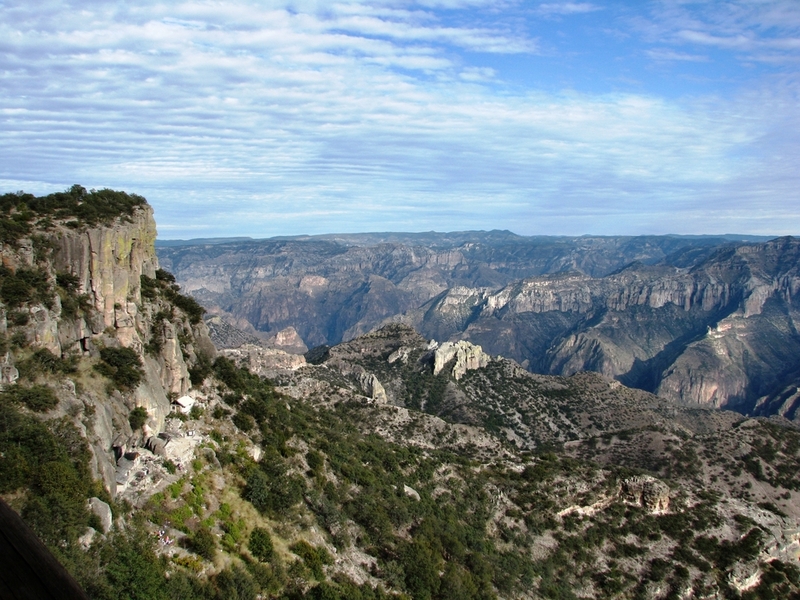 The Copper Canyon in Mexico. Photo credit: Shutterstock. A natural wonder rich in biodiversity and enticing indigenous cultures, Mexico’s Copper Canyon is a jaw-dropping highlight comprising ethereal rock formations, waterfalls, hot springs, and the most astonishing mountainous scenery in the whole country. Cathedral in Havanna, Cuba. Photo credit: Shutterstock. 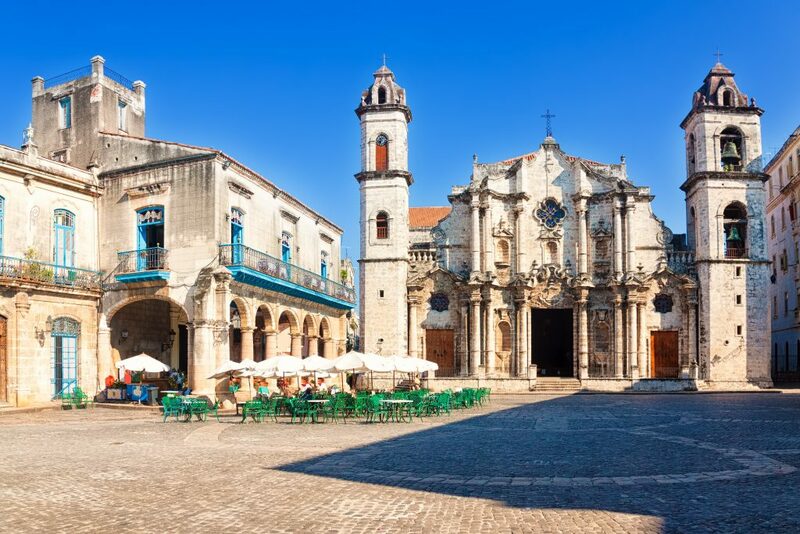 The capital city of Cuba is an intoxicating place to visit and makes for a fantastic base from which to explore the small but enthralling country. Havana may lack the modern infrastructure found in all other Central America capitals, yet this is perhaps the reason she is so immensely addictive. Salsa and rumba beats spill out of every café, and the wafting smells of street food, cigar smoke, and classic American car exhausts combine to create an atmosphere that’s entirely without rival. Havana is colourful, charming and seductive, and although the whole country is a phenomenal new place to discover, you’d do well to plan a few relaxing days here before moving on. Antigua in Guatemala. Photo credit: Shutterstock. 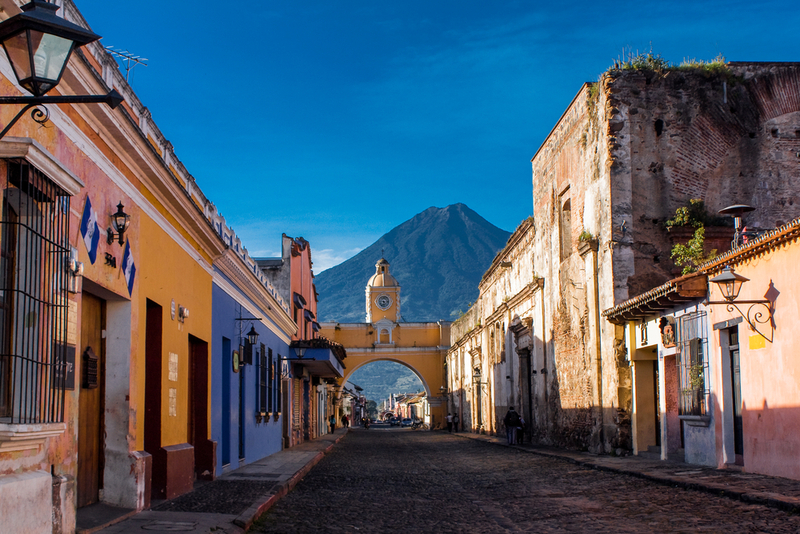 Not to be confused with the slightly more popular island which shares its name, Antigua is Guatemala’s crowning architectural glory and the best preserved colonial city in all of Latin America. Revered for her beauty as well as her picturesque setting, this is a living, breathing UNESCO-listed treasure no visitor to Guatemala should ever miss. Framed by volcanoes and set at an altitude of 1,500m, Antigua is home to superb architecture, thriving local markets, and locals who are warm and welcoming. Antigua was founded in the 1500s and completely restored over two centuries later after a disastrous earthquake. The Arenal Volcano in Costa Rica. Photo credit: Shutterstock. Forced to pick just one country to visit in Central America? Then you may want to make it Costa Rica. 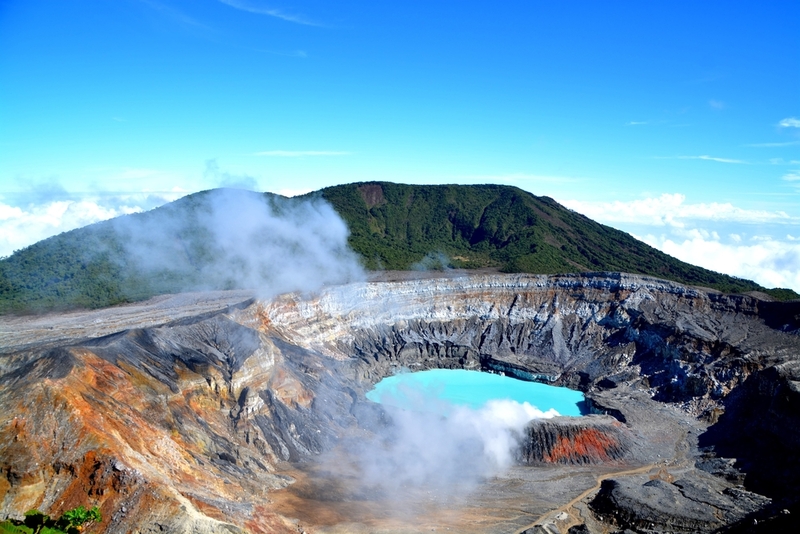 The most ‘modernized’ of all, Costa Rica is a mind-boggling country filled to the brim with natural attractions. Having traded in a military for an eco-friendly tourism based economy, Costa Rica is (and always has been) a haven of rare beauty, peace and tranquillity in the region. 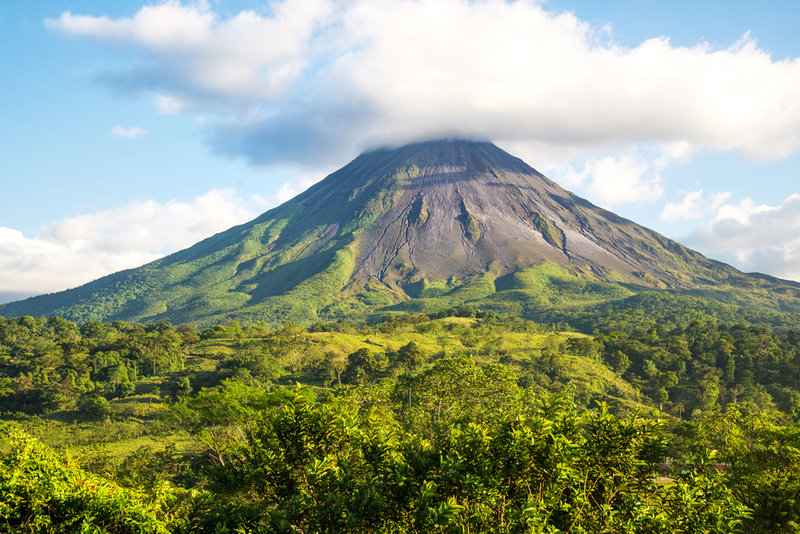 Out of all the country’s brilliant attractions – the stretches of unspoiled beaches, the array of amazing volcanoes, and long list of pristine nature reserves – Arenal Volcano shines brightest. This is one of the world’s most active volcanoes, which feeds a plethora of opulent thermal spa resorts. A popular active honeymooner’s getaway spot, the Arenal National Park is – much like the rest of Costa Rica – one of the most biodiverse corners of the planet and an astonishing destination if you wish to be immersed in wilderness and still enjoy premier comforts. 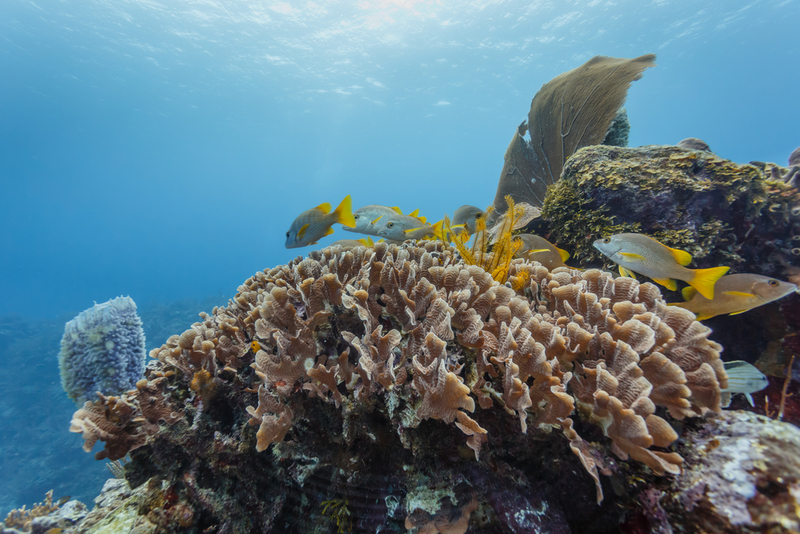 The colourful fish and coral in the Belize reef. Photo credit: Shutterstock. The UNESCO World Heritage listed Barrier Reef of Belize is the largest coral reef in the northern hemisphere and, after Australia’s own, the second-largest in the world. Yet what makes it arguably the most impressive is that it’s far less known and visited. It covers a marine area of 960 square kilometres and is a Utopia for divers and snorkelers alike. Belize, as a whole, is a water sport lover’s mecca and one of those destinations where one ends up spending more time in the water rather than on land. No complaints, so far! Lake Atitlan. Photo credit: Shutterstock. 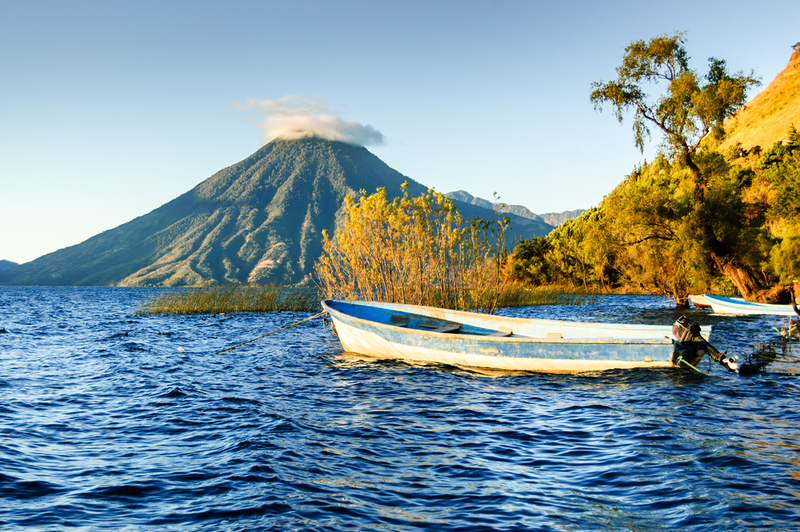 A breathtaking lake framed not by one but three vertiginous volcanoes, Lake Atitlan is nestled in the mountains of northern Guatemala and surrounded by gorgeous ethnic villages. 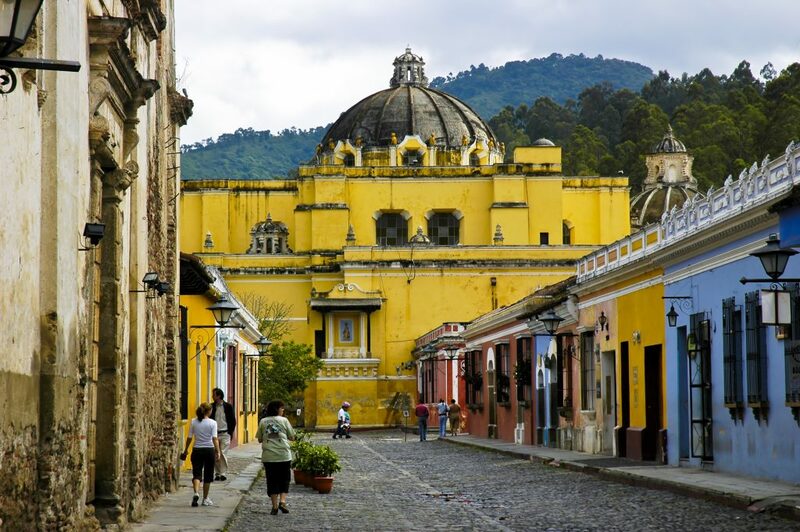 Guatemala is also renowned for its artisanal crafts and many tours also focus specifically on touring the country’s best markets, workshops and plantations. 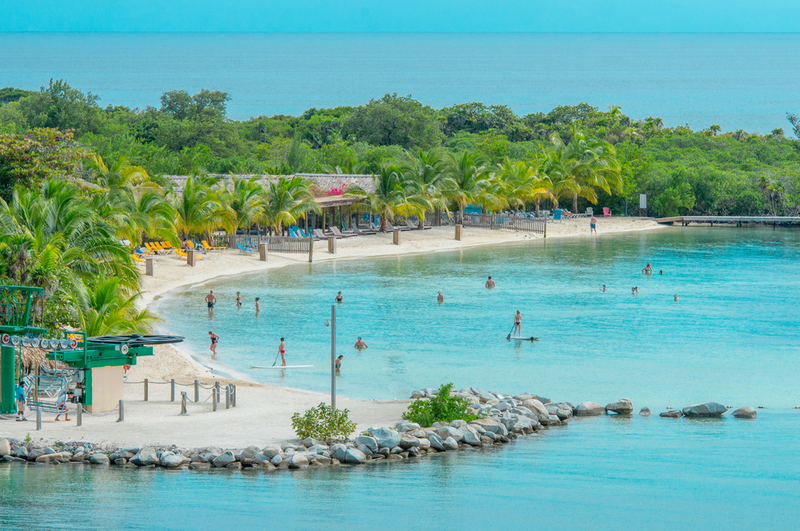 The beach on Roatan. Photo credit: Shutterstock. That spectacular barrier reef off the coast of Belize continues uninterrupted along the coast of Honduras. And here, in a beautiful archipelago, is where you’ll find Roatan, the largest and best kitted island in Honduras. Under the sea there are corals and marine wildlife to admire, and above the waterline a thrilling assortment of exciting water sports in which to partake. Then, there are the sparkling sandy beaches for the very sweet doing of nothing at all. Pick your poison. Itching to go to Central America? Call us! Chimu Adventures is your Central America specialist, and we love nothing more than to share our passion, knowledge, and insider secrets to plan one-of-a-kind adventure tours that are tailor-made with you in mind. So whether you wish to visit Belize and Guatemala, Costa Rica and Panama, Cuba, Honduras and Nicaragua, as well as Mexico and its dazzling Yucatan Peninsula, trust that we’ll plan a wicked itinerary that will include all the incredible wonders which make this region so massively enticing. Click here for more information about Chimu.